replacement options for missing teeth. In need of a tooth replacement? Missing teeth can affect the way you look and the way the rest of your teeth bite together. Your remaining teeth may tilt and drift into the gaps. If lots of your teeth are missing, your facial muscles can become saggy, making it harder for you to speak clearly. Dental implants are considered the standard of care for replacement of missing teeth. A dental implant is a surgical fixture that is placed into the jawbone and over the span of a few months is fully fused with the bone. 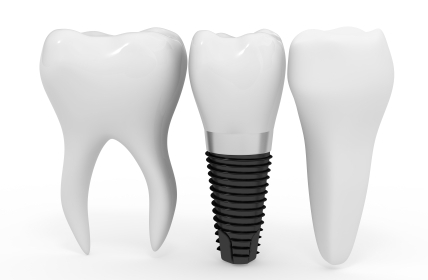 The dental implant acts as a replacement for the root of a missing tooth. It is the closest thing to mimicking a natural tooth because it stands on its own without affecting the nearby teeth and has great stability. We refer implant placement to a specialist and once the implant has integrated fully into the jawbone Chris places the required crowns and bridges that will be supported by the implants. These are also known as fixed partial dentures and consist of two crowns, which are placed on your natural teeth either side of the space, with a false tooth in the middle. In this way, your new false tooth is held firmly in place by your own teeth on either side. Partial dentures are also an effective and popular choice. If you have missing teeth and would like to discuss the options above, contact us now to book your consultation. We can help you restore the appearance and oral functions that you have lost.